There is a real temptation during the week of February 14th to write about St. Valentine and how he performed secret marriages among the troops. It is a temptation I have no problem resisting. Instead I’d like to tell you about the creation of an alphabet. On occasion however, things happen very differently. Around the year 860, Rastislav, one of the Moravian princes, asked the Byzantine emperor to send someone to teach his people about Jesus Christ. Patriarch Photius assigned two brothers, Cyril and Methodius, to the task. It was a good choice. Cyril (his adopted monk name, original was Constantine) was born in Thessalonica around 826 to an officer in the Legion of Thessalonica and his Slavic wife. When his father died he moved to Constantinople, where he entered the Imperial University at the age of fourteen. Cyril was ordained priest and eventually became a professor at the university. After a mission to the Arabs, he joined his brother, Methodius, who had retired to a monastery on Mount Olympus, in Bythnia. By the time the Moravian quest was made Cyril was fluent in Latin, Greek, Arabic, Hebrew and Slavic. In Moravia, Cyril faced a challenge when it came to teaching the Slavs to read the scriptures; there was no written version of the Slavic language at the time. As a solution Cyril invented the Glagolithic alphabet, enabling him and his brother to translate both Biblical and liturgical texts into the vernacular. Their writings taught salvation through faith in Christ to the people in a voice they could understand. Christianity spread quickly among the Slavic peoples as a consequence. It should be noted that the edicts requiring the Bible to be read in Latin only came from Rome. As Patriarch in Constantinople Photius did not agree with a great deal that Rome had to say. He granted Cyril permission to create the local translation. Eventually, the Magyar invasions of the early 10th century and German opposition will reverse the evangelical progress the brothers made, but not their writings or the alphabet. Disciples transplanted Christianity to Bulgaria and carried the translations (and the alphabet) south. When Vladimir of Russia converted to Christianity a century later, he adopted the Orthodox faith. The brothers' translations and writings made their way to his court where they influenced the Russian church for many centuries. Cyril’s Glagolithic alphabet was improved upon by his disciples and became the Cyrillic script (named after their mentor), which is the alphabet used for several East and South Slavic languages—Belarusian, Bosnian, Bulgarian, Macedonian, Montenegrin, Russian, Rusyn, Serbian, and Ukrainian—and many other languages of the former Soviet Union, Asia and Eastern Europe. The original Glagolithic alphabet is known as Church Slavonic an d is still used in many Orthodox Church documents. 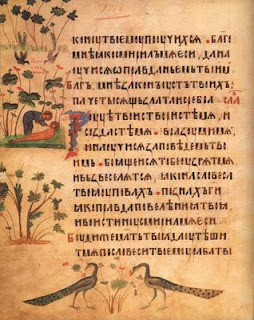 An example, a page from the the Kiev psalter, is pictured at right. German bishops of the Roman Catholic church had criticized the brothers and argued that the slavs should use Roman style worship. Cyril and Methodius travelled West to defend their practices. Pope Hadrian II accepted their work with enthusiasm but this did not please the Germans. In the end the Germans got their way. Cyril’s approach to spreading the gospel message continues to this day. Many of the world’s many languages did not have a written script until the likes of the Wycliffe Bible Translators came along and created one so the people could read the scriptures in their own vernacular. To date Wycliffe alone has translated the Bible into 611 languages and estimates that there are still 2644 languages to go, representing more than 380 million that still cannot read the Bible in their own tongue. Cyril created a textual language for millions of people when he set out to share the gospel with the people of Moravia. His example inspired many others who in turn have made the scriptures available to the entire world. Quite a legacy for one man and his brother. Cyril died in Rome and was buried in the Basilica of St. Clement. It was February 14, 869 — 1138 years ago this week. February 11, 1858: - Bernadette Soubirous, a 14-year-old shepherd girl from Lourdes, France, experiences her first vision of the Virgin Mary. By July she had 18 similar visions. Despite initial skepticism from the Roman Catholic Church, these claims were eventually declared worthy of belief after a canonical investigation. As a result the town became a major site for pilgrimages which attracts millions of Catholics each year. Saint Bernadette was canonized in 1933. February 12, 1915: - Blind poetess and hymn writer Fanny Crosby dies at age 95. Throughout her long career she wrote more than 8,000 gospel songs and hymns, including "To God be the Glory", Tell Me the Story of Jesus", and "I am Thine Lord". Many of her hymns remain popular throughout the Christian world. February 13, 1633: - Called to trial by the Inquisition, Italian astronomer Galileo Galilei arrives in Rome ready to explain his belief that the earth revolves around the sun. He was compelled to recant the view, and was placed under house arrest until his death in 1642. February 15, 1905: - Christian author Lew Wallace dies at the age of 77. Wallace is most famous for Ben Hur (1880) which was conceived on a train ride while arguing about Christ's divinity with famous agnostic Robert Ingersoll. It sold more than 300,000 copies in a decade, making him one of the best-selling religious authors of the 1800s. February 16, 1497: - German scholar and reformer Philipp Melanchthon is born in Bretten, Baden. He and Luther were at various times both allies and enemies. Melanchthon defended Luther against Johann van Eck and Emperor Charles V; however, Luther thrashed him for his views on the Sacrament. Interestingly, on his death bed, Luther said his one regret was his battle with Melanchthon. His argument for justification by faith alone, known as the Augsburg Confession, is now the basic statement of Lutheran doctrine. February 17, 1858: - Waldensians, ancient "Protestants" from the Italian Alps who survived through persecution for 800 years, are finally guaranteed civil and religious rights. They began with the teaching of a wealthy merchant named Pater Waldo in the late 1100s; thus they are considered "the oldest evangelical Church".